This is our first look at Marvel’s long running title Strange Tales (well, we did do the annuals). It actually started as an Atlas title in 1951 as a horror book. It ran for an incredible one hundred issues in this format. 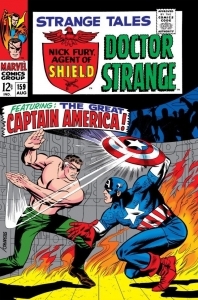 It then changed to a super-hero book starring the Human Torch and turned into a “split book” with the full time arrival of Doctor Strange in issue #114. Nick Fury Agent of S.H.I.E.L.D. 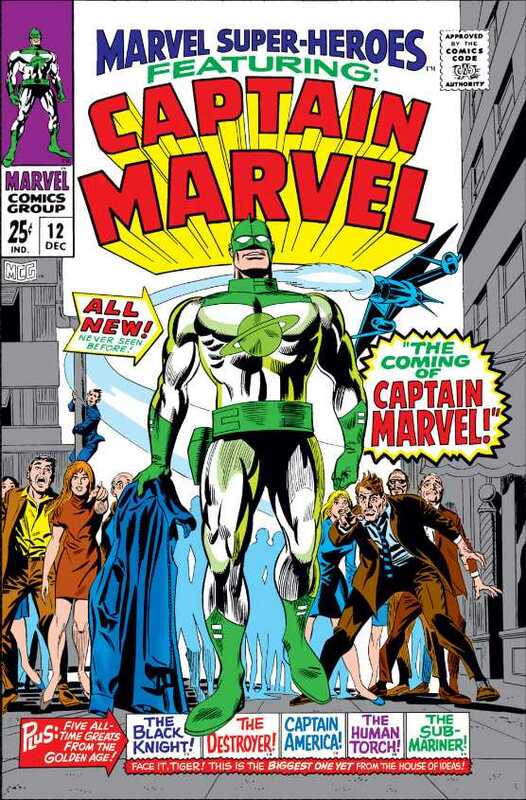 took over from the Human Torch/Thing combo in issue #135 and the book ran in this format through issue #168. 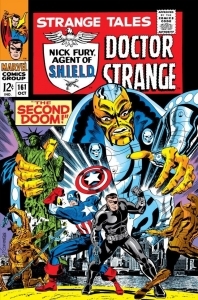 Our run today focus’s on these last books in the title before Nick Fury and Doctor Strange would leave for their own (short lived) books. 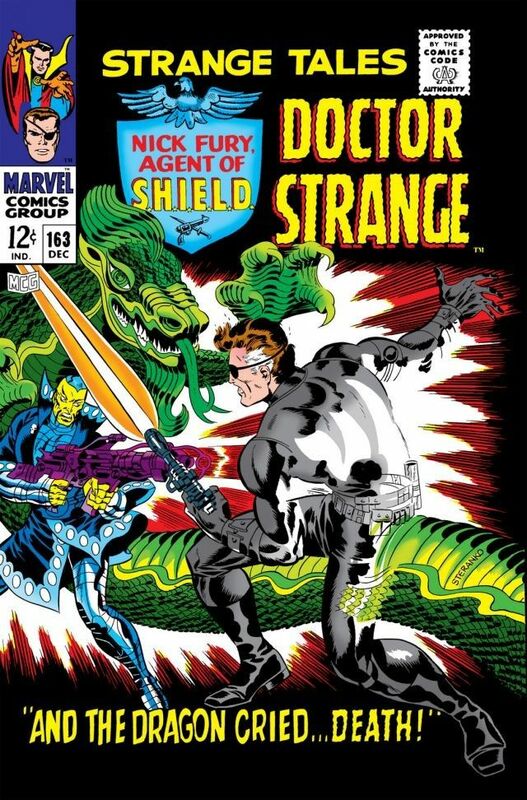 We are only covering Nick Fury today as I have other Doctor Strange runs I like better than this one, and I’ll cover them some time in a future post. That said the Doctor Strange stories here in these books aren’t too shabby. The good Doctor tangles with Baron Mordo, Nebulos, the Living Tribunal, Yandroth, Victoria Bentley and others in this run of books. 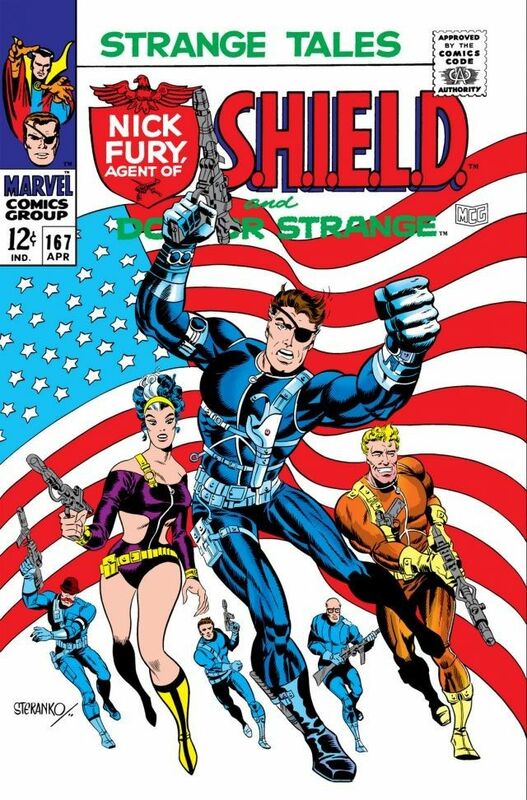 Jim Steranko started on Nick Fury Agent of Shield in issue #151 finishing Jack Kirby layouts. 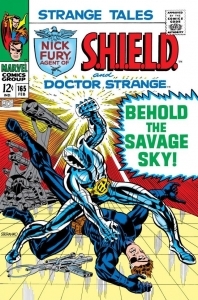 By issue #155 Steranko is not only doing all of the art work he has taken over the writing chores from Stan Lee and Roy Thomas. And does he ever run with it. Nick Fury becomes a hip 60’s type hero in the Marvel Universe, a cross between James Bond and Man from Uncle. 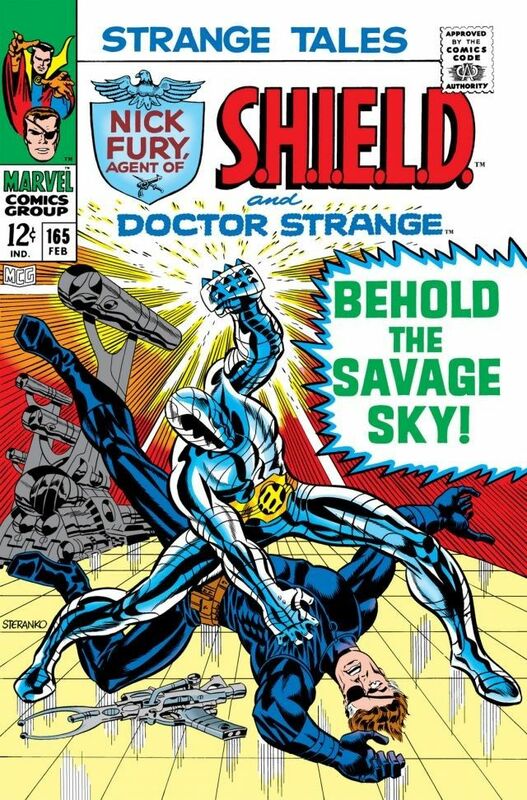 Steranko’s psychedelic artwork and use of panels/borders completes Fury’s transformation to cool. 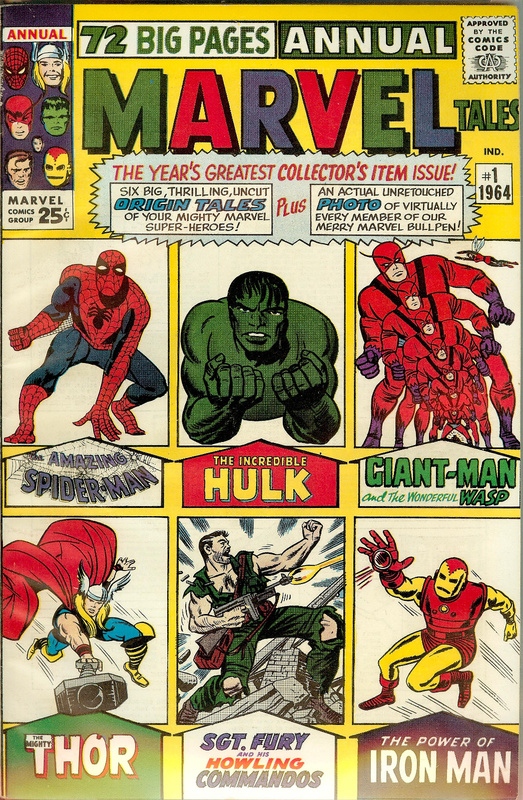 I was only 11 or 12 when this stuff hit the spinner-rack and I was awe-struck. I still am. I can’t remember another time when the Kirby/Lee team left a book and the same title/character became better for it. 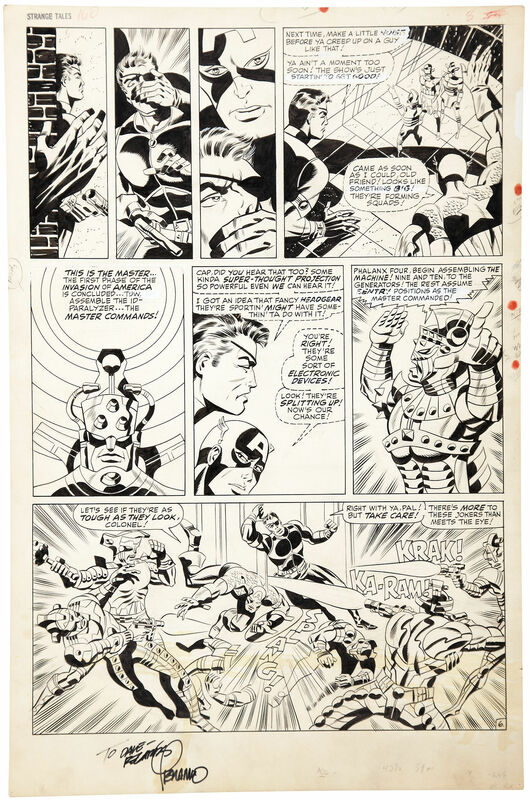 Jim Steranko did have some inking help on our run of books today. Inking chores from Frank Giacoia, Joe Sinnott, and Bill Everett complete the pictures. This book is a good jumping on point for new Nick Fury Agent of Shield fans. Nick and Shield have just taken down Baron Strucker and Hydra. In the aftermath of victory, some of the team move on Dum Dum Dugan, Clay Quartermain, and Gabe Jones are on the move again. Nick re-visits his old stomping grounds in Hell’s Kitchen and we are treated to an origin story of sorts. Next Nick visits a Shield spy school and is introduced Countess Valeria (Val for short -A bond type girl) and the Gaff a bond type Q who invents things. 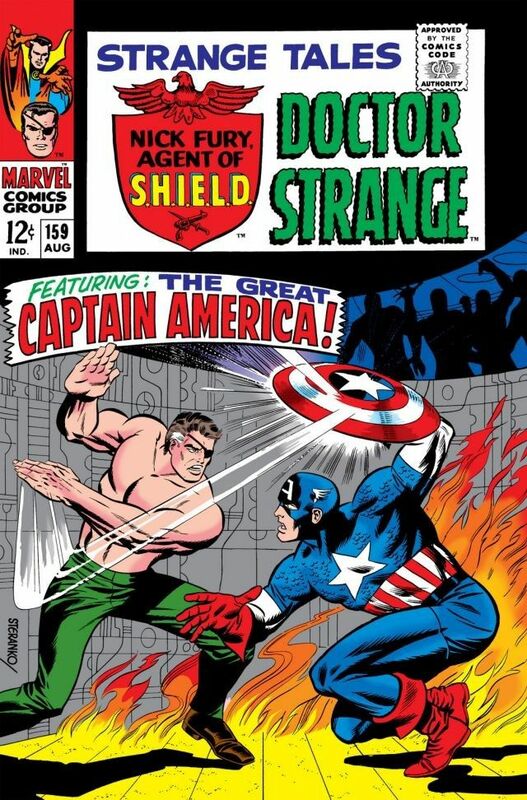 Last but not least a re-union with Captain America (last time together is Tales Of Suspense #78). They have a spirited tussle in an exhibition match in front of prospective students. Captain America tells Nick at the end of the match that they have a new mission involving the Big Blackout as this issue comes to and end. We meet top FBI man Jimmy Woo for the first time, and he gives Nick Fury and Captain America everything he knows about the case of the Big Blackout in New York. It turns out there is an alien threat and it is located at the Statue of Liberty. Nick and Cap race to the scene and find an army of super powered beings. Cap and Nick attack with little success. Nick Fury goes it alone, after he sends Captain America to the Fantastic Four for help. Only problem is Cap’s parachute isn’t working and he is free falling to earth. Nick Fury is tossed off the Statue of Liberty and now he is free falling. Now I can’t get that damn Tom Petty song Free Falling out of my head as this issue comes to a close. Strange Tales issue 160 page 8 by Jim Steranko. Source. The Thing and Mister Fantastic save Captain America from a nasty fall. They also provide Cap with the requested weapon and send him back to the Statue of Liberty to help Nick Fury defeat the alien hordes. Nick Fury is OK having just used up his 9th life for the 15th time. Once the battle is joined the aliens are defeated. Nick Fury and Captain America are trying to find out who set this all up when Jimmy Woo comes in and spills the beans. It’s the Yellow Claw (great two-page spread at the end of this story) and he has two sidekick Suwan (beautiful) and a yet unnamed thug with a skull cane. Things are heating up. What’s with all of the Claws? The Satan Claw in the hands of Baron Strucker was the dreaded weapon in the last story arc. 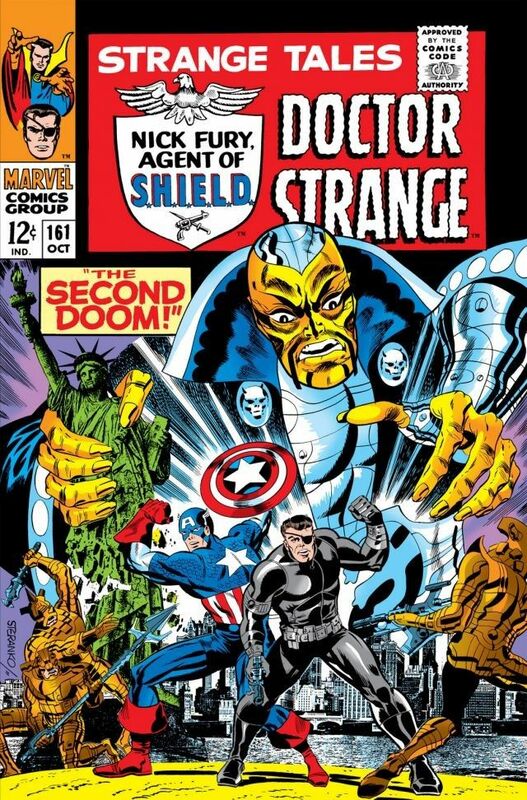 Steranko must have watched a lot of those Saturday morning serials. The Gaff has a present for Nick Fury – a stealth Ferrari made out clear fiberglass. Really cool. The unnamed thug at the end of the last issue is Fritz Von Voltzmann (there is always a Nazi). Jimmy Woo helps Nick Fury get to the Yellow Claws HQ (with the Ferrari). Once inside Nick Fury and the Yellow Claw have a parlay, and rather than soil his own hands disposing of Nick Fury, the Yellow Claw drops him down a hole in the floor to water and a giant octopus. Time for Nick Fury to use up his 9th life once again as this issue comes to a watery end. This book is my favourite cover of our run. Nick defeats the octopus and returns to Shield HQ and Val who is getting friendlier with Nick every issue. The Yellow Claw wants an A.I.M weapon called the Ultimate Annihilator (cousin of the Ultimate Nullifier playing out with Doctor Octopus and Spider-Man as we speak in Amazing Spider-Man #55). Suwan is working with Jimmy Woo and she informs them of the A.I.M weapon and there hiding place in Chinatown (still my favourite movie). 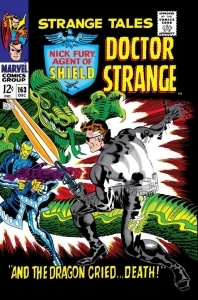 Nick Fury calls for all hands on deck, but only comes up with Clay Quartermain who joins Fury in an attempt to retrieve the Ultimate Annihilator (disguised as a dragon statue). It looks like they have done it but the Yellow Claw swoops in at the last minute and grabs the prize. A battle or two later the Yellow Claw has Nick Fury in his sights, pulls the trigger and Nick Fury disintegrates before our eyes. Time to use up 9th life #17 as this issue comes to a close. It turns out Nick Fury has not disintegrated at all but has been transported by Suwan to the Yellow Claw’s hideout. Nick gets back to Shield HQ but is in bad shape. The doc tells him he must rest or die. He doesn’t listen to him of course. Nick suits up and heads back to the Yellow Claws base alone to try and stop him from using the Ultimate Annihilator on the planet earth. He is defeated once more and this time is staked out over a hole in the Yellow Claws ship and the Ultimate Annihilator is pointing right at him as this issue comes to a close. I am not saying anything. Dum Dum Dugan and the Shield Heli-carrier arrive in the nick of time to save Mr. Fury. They have the Yellow Claw on the run and have captured the Ultimate Annihilator. They also take out Von Voltzmann. The Yellow Claw does escape with his robot duplicates and powerful new costume, which he uses to pummel Nick Fury and vows to return…. Old Nick Fury may be down but he is never out. This issue begins with Nick Fury chasing the Yellow Claw into the ocean and his undersea lair. As Nick is trying to break-in Jimmy Woo is teleported in by the Yellow Claw and tied to a polarizing ray gun. Suwan pleads with the Yellow Claw to spare his life, which of course he refuses to do. Nick Fury finally breaks in and he and the Yellow Claw resume their battle. Suwan frees Jimmy Woo just in time, however she is caught in the polarizing ray and is killed. Jimmy Woo blames both Nick Fury and the Yellow Claw for her death and vows to avenge her death, as this issue comes to an end. The wrap-up to the Yellow Claw saga and is the best issue in the run. It also features a beautiful American flag cover. This book is a visual feast. There are six splash pages in this book, including the first four splash page spread in comics. This meant you required two comic books to get the full effect, laying down side by side. Very clever – Stan Lee would have been proud. I have read that the next Sterenko artist edition will contain a four panel gate fold in the book which would be a wonderful add if it ever printed. Clay Quartermain, Dum Dum Dugan, Val and the rest of Shield arrive to clean up the Yellow Claws henchmen. It’s down to Nick Fury and the Yellow Claw for the final time. The battle rages on and Nick is prepared bringing the dreaded Satan Claw with him. He tears into the Yellow Claw and finds to his surprise he is… a robot! 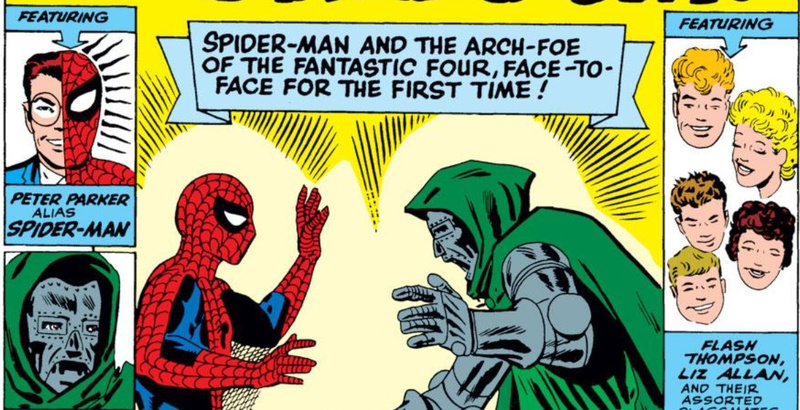 We switch scenes for the final two-page spread of this story, to Latveria and the lair of Doctor Doom. A computer is signalling the end of a chess match between Doctor Doom’s automated pieces and Shield, with Shield the winner, and Doctor Doom the sore and angry loser. A real twist ending to be certain. The final issue of this run feels like an epilogue. Nick Fury is recuperating after his epic battle with the Yellow Claw and is still trying to piece it all together when he falls asleep. He has a very bad dream about the end of the earth. The type of dream he probably has all too often. I don’t feel too bad for him though. He’s still got Val and his own book beginning next issue. The 45th Overstreet Prices are listed below for the books covered today. I have always thought the prices for Strange Tales in general were bit on the low side, however in my experience these books rarely get guide and quite often can be had for much less. I think a lot of people don’t like the split books. If you are a fan they can be a real bargain, in particular the Nick Fury Steranko books. Not everyone is enthralled with Jim Steranko’s work. I am and also biased of course, but if you have never seen some of these Steranko books or early Nick Fury issues, I would encourage you to look them up the next time you are at a con or local comic shop and see them up close and personal. They are hard not to like. See you next month. PreviousWhat Happened To Your Head? This series, more than any other, except perhaps Barry Windsor Smiths early Conan issues , shows the rapid growth and advancement as an artist that Jim Steranko went through during his short run in monthly comics. Is it a coincidence that both of them started off finishing Kirby breakdowns? I agree with you on the Kirby layouts being a big assist to Sterenko’s development as an artist. I’ve read Sterenko on Kirby stories and he has a lot of respect for the man and the help he provided early on in his career.. I just recently sold nice raw high grade copies of #159 and #167 to a very happy buyer. The covers are great and to tell you the truth I don’t know why these books didn’t sell sooner. I had them priced below Guide and they sat for a while. Too many people chasing Flavor of the Month books and ignoring some great Silver Age. Sold these a couple of weeks ago Mike so you’re post doesn’t qualify you for a commission. I’ll have to come down and scout your boards before I do my next post. They are great books, and those two in particular stand on their own very well as the beginning and end to a lengthy Nick Fury story line.